Los Angeles Dodgers closer Kenley Jansen knows he’s not off to a good start in 2018. In his two appearances, Jansen has lost a game and blown a save. It may be a small-sample-size, but it’s a huge shock to see one of the top closers in baseball struggle. Thus far, Los Angeles has paid the price for those struggles, winning just two of their first five games. However, Jansen says he’s not worried. 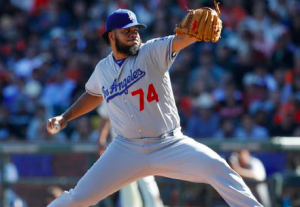 In his first outing of the season, Jansen surrendered a 9th inning home run to Joe Panik, giving the San Francisco Giants a 1-0 win over the Dodgers. In his next appearance Monday against the Diamondbacks, Jansen gave up a three-run homer to Chris Owings in the bottom of the 9th. The home run forced extra innings, with the Dodgers ultimately losing the game in 15 innings. The blown save, not to mention the two walks Jansen gave up, prompted some tough questions directed at the closer after the game. But Jansen insists it’s a small hiccup that happened to come at the start of the season. Aside from the poor results on the field, a dip in Jansen’s velocity could also be a cause for concern. Instead of easily reaching 93 mph or higher on the radar gun, Jansen is struggling to break 90 mph with his fastball. His average velocity on the season is 90.6 mph. Jansen also walked two batters during Monday’s blown save. Such an event is almost unheard of for Jansen, who has walked a total of 26 batters over the past three seasons combined. Jansen has reportedly worked with Dodgers pitching coach Rick Honeycutt on some mechanical changes. But the closer denies that has played a part in his struggles, as he continued to dismiss the blown save as a blip on the radar. Of course, the Dodgers might care. Despite being favored by many to win the NL West at the start of the season, they can’t be pleased with a sluggish start to the season. The Diamondbacks, Rockies, and re-loaded Giants are all potential challengers insdie the NL West. If Jansen continues to struggle, it could keep Los Angeles from creating separation from the other teams in the division. It’s possible that Jansen will have things sorted out the next time he takes the mound. After all he’s done the past few seasons, he certainly deserves the benefit of the doubt. However, in such a tight division, the Dodgers can’t afford to have an unreliable closer. Until Jansen can get back on track, there will be reason to worry, no matter how much the closer tries to downplay his early-season woes.